As we continue celebrating National Poetry Month, I’d like to share a few more great (and free) online poetry links and resources with you. Poetry-Writing Workshop with Karla Kuskin – Children’s poet Karla Kuskin helps children turn their words and ideas into descriptive and powerful poems. Ms. Kuskin includes writing tips that she uses when she writes her own poems, as well as ideas children can use to revise their work. 10 Compelling Reasons to Memorize Poetry – Memorizing a poem can be one of the most fulfilling and fun ways to explore poetry. Poetry Foundation – Browse for poems by title, poet, or subject matter such as “Animals” or “Stars, Planets, Heavens” (both found in the Nature category). Poetry in Homeschool – Need help incorporating poetry into your homeschooling? Jimmie of Jimmie’s Collage shares ideas, resources, and links. Interactive Word Mover – Using this online too that’s similar to magnetic words, children can move individual words around to create original poems. 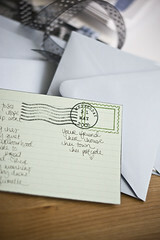 Not only is April National Poetry Month, it’s aslo National Card and Letter-Writing Month! Here are two ideas for incorporating poetry and letter writing. Write a Letter to a Poet – Let the poets who you are reading know that you appreciate their work by sending them a letter. Put a Poem in a Letter – Next time you send a letter or holiday hello, treat the addressee to a poem as well. You can put a poem directly into the text of your letter or include a typed or handwritten copy in the envelope. Have you ever memorized a poem? What is one of your favorites? Some of my favorites and a few brand new to me and all in one place = happy, happy Maggie! Thank you, Kim! Thanks for coming by to share the poetry love, Maggie! Nice list of useful resources! Please, check out http://www.rhymedesk.com. If you like it, I’d be grateful, if you could add this poetry writing tool to your list of poetry links.